Tired of the same old, cookie-cutter rooms offered by hotel chains? Well, a growing number of privately-owned hotels are offering a remarkably different lodging experience. A hostel made from an actual Boeing 747, located in the Stockholm Arlanda Airport in Sweden. It has 25 dormitory-style rooms, plus a luxury suite in the cockpit!. In the summertime, you can walk along the left wing observation deck and experience the feeling of standing on top of a real jumbo jet's wing. It's $52 for a 4-person dorm, and $244 for a double bed private suite. Individual hotel rooms are made of giant concrete drain pipes. There are locations in Ottensheim, Austria and Bottrop-Ebel, Germany. The drain pipe rooms have double beds and electricity. The facility has a "pay as you wish" system in which customers leave a Euro amount they can afford and wish to, to support the project. 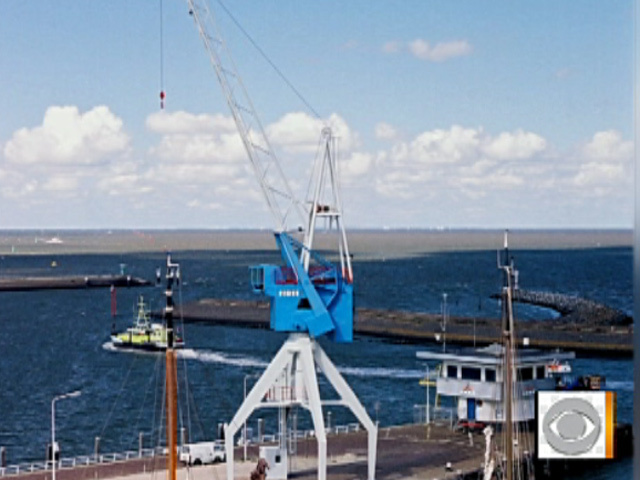 Made of an old shipping crane on a dock converted into a luxury hotel for two, in Harlingen, Netherlands. Breakfast is included and delivered via -- an internal lift to your bedroom. A private mountain retreat in the woods of Mt. Rainier, located 50 feet up in a 200-year-old Western Red Cedar tree. Large enough to accommodate up to five people. There's a bathroom, kitchen and dining area, not to mention skylights and an observatory at 100 feet. Sweet Willy is a 30-foot tall structure, flanked by his little brother Toby, a 12-foot tall statue. Four guests can sleep inside Sweet Willy, two in a queen-sized bed in main the body, two up in his head. The muzzle can also fit kids who are under four feet tall (two can sleep in there, lengthwise). By Sweet Willy's "backside" is a deck and big picture window for gazing out onto the prairie. The dogs were built by husband-and-wife team Dennis Sullivan and Frances Conklin, who specialize in chainsaw art, so check out the studio where they create chainsaw dog carvings that are available in the gift shop. Rates start at $92 a night, including breakfast. More and more countries are converting former dictators' homes and retreats into full-scale hotels. Tucked in the hills of Sochi in Southern Russia is Joseph Stalin's "dacha," or country home, where guests can spend a night or take a guided tour. First, if you've never heard of Sochi, you will. This resort town won the bid to host the 2014 Olympics, and while it's not on most Americans' radar, it's known as the Russian Riviera or the Pearl of the Black Sea. Stalin, who ruled the Soviet Union until 1957, came to this beach resort almost every summer. It was opened up as a hotel and attraction in 1991. What's most astonishing about visiting Stalin's villa is how peaceful the setting is. Nothing about it says "a dictator lived here," except the plaque at the front entrance. The dull, understated green exterior of the villa was intentionally designed to blend in with the local scenery -- after all, Stalin didn't want unwelcome visitors in his summer home! Step inside the modest-looking structure and you'll enter a spacious, luxurious, well-preserved home that is nearly unchanged from Stalin's days. It was built in 1937, and guests can still see original furniture, chandeliers, and even a silver ink pot that was presented to him by China's Chairman Mao, The most notable sights of all? A life-sized wax image of Stalin seated at his desk. His portrait also looms in the dining room, and guests can wander through his bedroom and the billiards room where Stalin loved to entertain. Sleeping with Mussolini? Why not? Grand Hotel a Villa Feltrinelli is an ornate palazzo on the western shores of Lake Garda in Gargnano, Lombardy. Built in 1892, it once served as the summer home of lumber magnate Faustino Feltrinelli, and was purchased in 1997 by legendary hotelier Bob Burns. But in between, the grand estate actually served as the hiding place of Italian dictator Benito Mussolini during World War II. As the story goes, Nazis took over the property in 1943 and brought the exiled Mussolini and his ministers to Lake Garda where he remained -- quite unhappily. Mussolini saw himself essentially an isolated prisoner, guarded full-time by German officers for two years until he left in April 1945, and shortly thereafter was arrested in Lake Como and executed by firing squad. The villa as we now know it opened in 2001, after five years and $35 million of restoration. All 21 suites are ultra-luxurious, but if you want the real over-the-top experience, stay in the Magnolia suite in the main villa where Mussolini slept -- you can still see the original marble bathtub and furniture from his days.